Just like Kung Fu Cat I used Koolmoves to create my Flash animated version of Demon Biker. Although the character took longer than Kung Fu Cat I did find him easier going as I had learned a lot with the cat on dividing a character into easily poseable sections. Many of his actions were created simply by moving and rotating various body parts with only minimal redrawing done. Watch my demonstration video for Demon Biker below. This shows all the initial moves he started with - I've since added a few more. 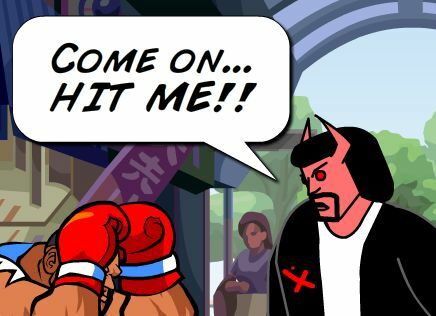 You'll notice in the animation that Demon Biker draws a gun on Balrog (his Street Fighter opponent). User Created Custom Characters can't actually hold props like official GoAnimate characters. If you try the prop will disappear. To compensate I gave Demon Biker a 'point arm' action where his hand remains rock steady in the same position, even though the rest of him is moving with the standard minor 'breathing' movement. This allows any kind of pistol style gun to be positioned behind his hand (without the character actually being made to hold it like you would with other GoAnimate characters). I learnt something new with animating Demon Biker's motorbike. In Koolmoves you can set up an object to rotate and Koolmoves will handle the 'tween' frames automatically. In this case I wanted the motorbikes wheels to turn - which I achieved simply by rotating the wheel spokes on their own rather than the whole wheel. As it turned out my wheel spokes weren't quite centred properly causing them to go slightly out of line as they turned the first 180 degrees then back into line as they completed the full revolution. This was actually a 'happy accident' as to compensate I moved the whole bike down, back into line on the key frame at the 180 degree mark. What I ended up with is a motorbike that moves slightly up and down, simulating how the suspension might react to the ground, creating a more realistic looking, travelling motorbike. I'm pretty happy with how Demon Biker turned out. I'll be adding more moves as time goes on but for the most part it's possible to get by with what he has now.